Women in the Arts and Media Coalition: WMM's newest, SONITA, wins big at Sundance! New York, NY -- SONITA directed by Rokhsareh Ghaem Maghami, was the big documentary winner at Sundance, winning both the Grand Jury Prize and the Audience Award in the World Cinema Documentary Competition. Sonita, an 18-year-old Afghan refugee in Iran, thinks of Michael Jackson and Rihanna as her spiritual parents and dreams of becoming a big-name rapper. For the time being, her only fans are the other teenage girls in a Tehran shelter. And her family has a very different future planned for her: as a bride she's worth $9,000. Director Maghami poignantly shifts from observer to participant altering expectations, as Sonita's story unfolds in an intimate and joyful portrait. 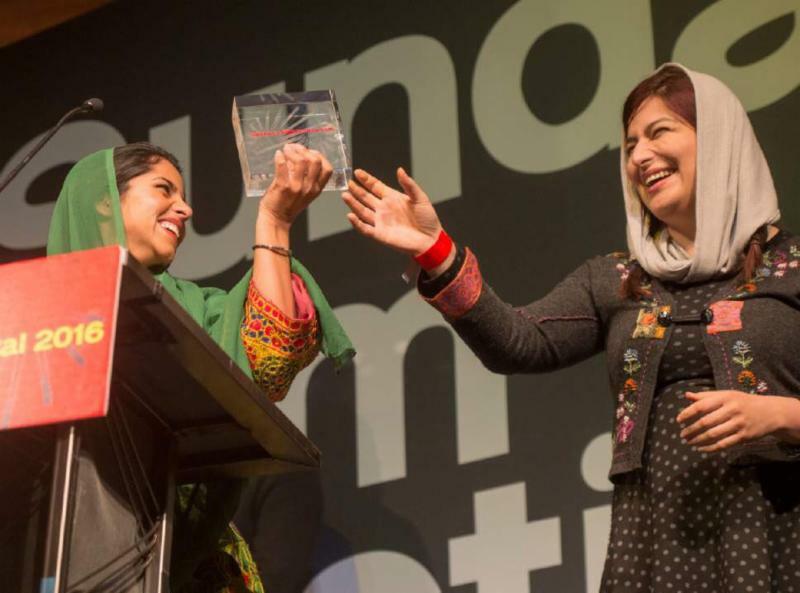 "Sonita's beats are as solid as stones, her rhymes are fierce, and her videos are a piercing howl against the constant injustice, fear, and sexism women must endure," writes the Sundance Jury, "SONITA highlights the rarely seen intricacies and shifting contrasts of Iranian society through the lens of an artist who is defining the next generation." SONITA was made with the help of WMM's internationally recognized Production Assistance Program. Two other films from the program were also awarded in the US Documentary Competition: WEINER by Josh Kriegman and Elyse Steinberg won the Grand Jury Prize and TRAPPED by Dawn Porter won the Special Jury Award for Social Impact. WMM's Production Assistance Program assists women directors with their productions from concept through completion. SONITA's awards continue WMM's winning streak, at last year's Sundance Film Festival, DREAMCATCHER by Kim Longinotto, a 2015 release from WMM which aired on Showtime and is now streaming on Netflix, won Best Director in the same category. And CITIZENFOUR, the 2015 Academy Award winning Best Documentary, also was produced with the assistance of WMMs Production Assistance Program.